In India, flags (hata　旗) were used during a war and fight to distinguish between the fiend and the friend. Later Buddhists started using flags to demonstrate the power of the Tathaagata-Buddhas and Bodhisattvas in overcoming foes of the religion (gooma　降魔). These kinds of flags and banners are called Banners of Victory (shooban 勝幡, shoodoo 勝幢). (There is even a temple, Shooban-Ji of this name 勝幡寺(山崎). Banner in the meaning of BAN 幡 (S: pataakaa > J:hataka > hata) have been used in India to mark a war camp, whereas DOO 幡( (S: ketu) have been used during sports events to mark the camp of elite families. DOO is the Chinese character of the T'ang dynasty, and is often used for a banner in esoteric Buddhism. To overcome the demons, especially the inner demons of a practitioner. Also to lengthen the lifespan of man. To make a flag with your own hands (especiallt the ones of cloth) helps to calm the mind and was often made by the widows of warriors. A ritual object of decoration for the holy area in a temple. An offering from laypersons, especially for the memory of lost ones. 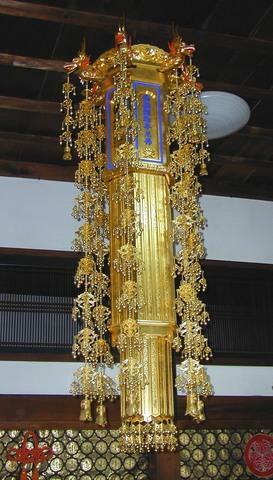 It is hung in the inner sanctuary (naijin　内陣) beside the canopy or the seat of the priest. The one on the left is made from cloth, the one on the right from gilded wood. Long small stripes, which are held together with a metal hanger (tsurikanagu釣金具, tsuriwa kanagu　吊り輪金具). The various parts of a banner in Japanese style (waban 和幡 see picture above on the left))are named like the parts of the human body. The topmost triangular part is the banner head (bantoo 幡頭), which has a tongue (zetsu　舌） in the middle. The large rectangular part is the body (banshin　幡身). It consists of many fields (tsubo坪), which are surrounded by a band (fuchi　縁). In case of metal banners, these fields are connected with metal hinges, the Butterfly Hinges (chootsugai蝶番). Banners from cloth can also be held together by cloth bridges or literally: dams (tsutsumi　堤). Below the head and on the sides there are the long hands (banshu, banju　幡手), at the bottom part the feet (bansoku　幡足).These feet can also be in form of small bells. Since the Heian period, the number of the fields is usually three and the feet are four. Before this period, these parts were not fixed. Banners in the Chinese style (karaban 唐幡) have only one field and on both sides one long banner hand. One example is the famous banner in the Shoosoo-In in Nara, the "complex silk gauze Banner (ra ban　羅幡, ra no doojoo ban 羅道場幡（らのどうじょうばん）). Banners can be divided according to the kind of material, the color, size, patterns, the place where they are hung and many others. In the following I will introduce the mosts important ones. 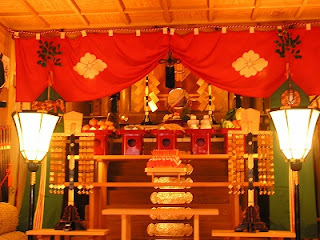 Cotton Banner (menban　綿幡), Silk Banner (kinuban 絹幡, hirahataヒラハタ) oder Brocade Banner (ayaban 綾幡, nishiki ban 錦幡), Goldbronze　Banner (kondooban　金銅幡), Juwels Banner, Wood Banner or Paper Banner. Banner from cloth are also called cloth stripes banners (retsuseiban, kireban). Some are delicately embroidered (shishuuban　刺繍幡). Thread banners (itobata　糸旗, shiban　刺幡）have hands and feet from bundles of silk thread. Metal banners are often decorated with thin metal plates and fretwork (sukashibori　透かし彫り). Jewel Banners (tama no hata, gyokuban 玉の旗、玉幡)are made from agate (menoo 瑪瑙), Lapislazuli (ruri　瑠璃), glas, mountani crystals (suishoo　水晶) and other precious stones. A precious banner has a wishfulfilling jewel at the very top. Banners of one color only (tanshoku ban 単色幡) are in white, red, yellow, green, light yellow or violett. The material can be cloth, wood or paper. They are especially used in ceremonies of the Esoteric Buddhist Sects. Banners of many colors (zooshiki ban　雑色幡) in five, eight (hatsushikiban) or nine colors. Often used for ceremonies when praying for the recovery of a sick person. Five here symbolizes the five inner organs　(五臓). The colors are green, yellow, red, white and black. There can also be five banners in one of the colors each. Small Banner (kobata, shooban 小幡) or large banner (oobata, daiban 大旗、大幡), which could be more than ten meters long. In a hall (dooban堂幡), in the Golden Hall (kondooban　金堂幡, chuudooban　中堂, butsudooban　仏堂幡), in the hall of veneration (raidooban　礼堂幡), in the temples of esoteric Buddhism also simply called "Hall Banner" "dooban　堂幡" "doo　堂"; in the Hall of Preaching (koodooban　講堂幡). In this case, banners of eight symbolic colors are used. Garden banners （niwabata　庭旗, teiban　庭幡) for Rain Rituals (amagoi) 雨乞い. 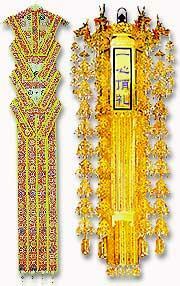 These are often decorated with jewels and silk thread of green color. These banners hang on a pole which has a dragon head (ryuuzu　竜頭) on the top. Banner on a roof (okujooban　屋上幡); Banner at the seat of a priest (koozaban　講座幡); Banner on a canopy (tengaiban 天蓋幡）. Banner for initiation ceremonies, Banner for life-prolonging rites, for prayers for the dead. Banners for burials (soogiban　葬儀幡): four banners from white paper or white silk with the Sanskrit syllables of deities such as Amida Nyorai (Amitaabha), Kannon Bosatsu (Avalokitesvara) and Seishi Bosatsu (Mahaasthaamapraapta), who comes to welcome the soul to the Paradise of the West. Banner for ceremonies for the Hungry Ghosts (segakiban　施餓鬼幡）, usually during the Bon Festival (o-bon) お盆. Banner as an expression of the veneration of the Buddhas (shinban). The sun is on the right, the moon on the left side of the Shinto altar. Fahnen (hata) dienten in Indien auf dem Kriegsschauplatz der Markierung der Feldlager, um Freund und Feind zu unterscheiden. Sie wurden bald vom Buddhismus übernommen, um die Gewalt der Tathaagata-Buddhas und Bodhisattvas bei der Überwältigung der Dämonen und Feinde der Religion (gooma) zum Ausdruck zu bringen. Diese Banner werden auch "Siegesbanner" (shooban, shoodoo) genannt. Banner im Sinne von "ban" (S: pataakaa > J:hataka > hata) wurden in indischen Städten und bei Kriegsschauplätzen aufgehängt, während "doo" (S: ketu) außerhalb der Städte bei sportlichen Veranstaltungen der Adeligen aufgestellt wurden. "doo" entspricht auch dem chinesischen Zeichen der Tang-Dynastie. Die Bezeichnung "doo" für ein Banner wird vor allem im esoterischen Buddhismus benutzt. In China wurden Banner besonders häufig seit dem 6. Jh. bei buddhistischen Zeremonien aufgestellt. Abbildungen von Bannern (hatakinugasa, bangai) finden sich bereits auf den Wandgemälden der Tempelhölen in Dunhuang (Tonkoo), Nordwestchina. Überwältigung der Dämonen, besonders der inneren Feinde eines Praktizierenden. Weiterhin auch Verlängerung der Lebensspanne. Das Herstellen eines Banners diente weiterhin der "Beruhigung der Seele". Von Witwen wurden daher oft Stoffbanner gefertigt. Rituelles Schmuckobjekt oder Opfergabe, besonders für Verstorbene. Hängt im Tempelraum an den Säulen, am Baldachin oder neben dem Priestersitz. Lange, schmale Streifen, die an einem Metall-Aufhänger (tsurikanagu , tsuriwa kanagu) befestigt sind. Die einzelnen Teile eines Banners im japanischen Stil (waban) werden wie die Teile eines menschlichen Körpers bezeichnet. Oberer dreieckiger Teil: "Bannerkopf" (bantoo), an dem in der Mitte ein Band, die "Zunge" (zetsu) befestigt ist. Langer rechteckiger Teil: "Bannerkörper" (banshin); besteht aus mehreren Feldern (tsubo), die von einer Einfassung (fuchi) umgeben sind. Die Felder werden bei Metallbannern durch "Schmetterlings-Scharniere" (chootsugai) oder bei Stoffbannern durch Stoffbrücken, wörtlich "Damm" (tsutsumi) zusammengehalten. Am Bannerkopf und an den Seiten des Bannerkörpers befinden sich Ziergehänge, die sog. "Bannerhände" (banju, banshu), am unteren Teil des Bannerkörpers sind weitere Ziergehänge, die "Bannerfüße" (bansoku). Die Bannerfüße können auch in Form von kleinen Glocken sein. Seit der Heian-Zeit beträgt die Anzahl der Felder im allgemeinen drei und die der Bannerfüße vier; vorher war die Anzahl dieser Teile nicht besonders festgelegt. Banner im chinesichen Stil (karaban) bestehen aus nur einem Feld und rechts und links jeweils einer sehr langen Bannerhand. Diese Form findet sich heute noch im "Seidengaze-Banner" (ra ban) des Schatzhauses Shoosoin im Tempel Toodaiji, Nara. Nach der Art des Materials, der Farbe, der Größe, des Musters, des Aufhängeortes u.a. gibt es zahlreiche Unterteilungen der Banner, die hier nicht alle erwähnt werden können. Ein Banner kann daher auch verschiedene Bezeichnungen haben. Es folgt eine kurze Auflistung der wichtigsten Arten von Bannern; detaillierte Angaben finden sich bei Shimizu und Sekine. Baumwolle-Banner (menban), Seiden-Banner (kinuban, hirahata) oder Brokat-Banner (ayaban), Goldbronze-Banner (kondooban), Juwelen-Banner, Holz-Banner oder Papier-Banner. Banner aus Stoff werden auch "Stoffstreifen-Banner" (retsuseiban, kireban) genannt. Es gibt auch bestickte Stoffbanner (shishuuban). Bei "Faden-Bannern" (shiban, itobata) sind die Hände und Füße des Banners aus geknüpften und gebündelten Seidenfäden hergestellt. Metallbanner bestehen oft aus zahlreichen dünnen Metallplättchen mit Durchbrucharbeiten (sukashibori). Juwelen-Banner (tama no hata, gyokuban ) sind mit Achaten (menoo), Lapislazuli (ruri), Glas, Bergkristall (suishoo, subateka) u. a. verziert. Ein "Schatz-Banner" Precious banner, ist oben mit einem Wunschjuwel versehen. Einfarbige Banner (tanshokuban): Weiß, rot, gelb, grün, hellgelb oder violett. Das Material kann Stoff, Holzplatten oder Papier sein. Sie werden besonders bei Zeremonien des esoterischen Buddhismus verwendet. Mehrfarbige Banner (zooshikiban): Fünffarbig, achtfarbig (hatsushikiban) oder neunfarbig. Kleines Banner (kobata, shooban) oder großes Banner (oobata, daiban), das über zehn Meter lang sein kann. In Hallen (dooban), in der Goldenen Halle (kondooban, chuudooban, butsudooban), in der Verehrungshalle (raidooban), bei Tempeln des esoterischen Buddhismus auch kurz "dooban" oder "doo" genannt; in der Predigthalle (koodooban). Dabei werden oft achtfarbige Banner mit Symbolformen der Buddhas verwendet. Garten-Banner (niwabata, teiban) für Zeremonien zur Regenbeschwörung. Häufig mit Juwelen oder Seidenfäden geschmückt und von grüner Farbe. Diese Banner hängen an einer Stange, die oben mit einem Drachenkopf (ryuuzu) verziert ist und sind aus Fäden oder Seidenstoff. Banner auf dem Dach (okujooban); Banner an einem Priestersitz (koozaban); Banner an einem Baldachin (tengaiban). Banner für Beerdigungen (soogiban, shihonbata): vier Banner aus weißem Papier oder weißer Seide mit den Keimsilben der Heilswesen Amida Nyorai (Amitaabha), Kannon Bosatsu (Avalokitesvara) und Seishi Bosatsu (Mahaasthaamapraapta), die der Seele des Toten aus dem Paradies des Westens entgegenkommen. Banner für "Hungergeister-Zeremonien" (segakiban), meist während des Bon-Totenfestes im August (urabon). Banner als Ausdruck der Verehrung der Buddhas (shinban). Banner mit Figuren von Heilswesen (butsuzooban, eban) auf den einzelnen Feldern, z.B. Banner der fünf Buddhas mystischen Wissens (gochi nyoraiban), Bodhisattva-Banner (bosatsuban), Banner der Weisheitskönige (myooooban), Banner für den Weisheitskönig Fudoo (fudooban) u.a. Diese Banner sind meist aus Stoff hergestellt. Sie finden sich besonders häufig in China. In Tempeln des esoterischen Buddhismus hängen häufig Banner mit Keimsilben (shujiban) oder Banner mit Symbolformen der Buddhas (sanmayagyooban, buppooban) an Stelle von Figuren von Heilswesen; für Kannon Bosatsu eine Lotusblüte, für Fudoo Myoooo (Acala) ein Schwert (ken) u.a. Entsprechend dem Sutra-Kommentar Dainichikyoosho entspricht dem Begriff "doo" das Sanskritwort "dhvaja" und "ban" ist "ketu". Die japanische Version dieser beiden Begriffe ist eigentlich "hataboko". Ein "doo" ist in verschiedenen Farben geschmückt, während ein "ban" mit Mustern verziert ist und ursprünglich den Kriegsfahnen entspricht. Diese Fahnen hängen als rituelle Schmuckobjekte an den Säulen der Übungshallen (doojoo). Diese Fahnen symbolisieren gleichzeitig die symbolischen Werte von Banner und Fahne. Eine lange Stange ist oben mit einem Wunschjuwel geschmückt. Daran hängen sechs oder acht Stoffstreifen, die eine Art Röhre bilden. Selten sind die Streifen aus Holz (mokudooban) oder vergoldete Bonze. Sie werden oft gestiftet mit der Bitte zur Heilung bei Krankheiten. Fünf bedeutet dabei die fünf Sinneserfahrungen (gogyoo) bzw. die fünf inneren Organe (gozoo), für deren Gesundheit bei lebensverlängernden Riten gebetet wird. Entweder besteht ein Banner aus allen fünf rituellen Farben (grün, gelb, rot, weiß und schwarz) oder fünf Banner in jeweils einer Farbe bilden zusammen eine Gruppe. Bei einer Initiationszeremonie des esoterischen Buddhismus wird dem Initianden als Zeichen der Aufnahme in die Gemeinde Wasser über den Kopf gegossen. Das Berühren der Bannerfüße mit dem Kopf entspricht der Berührung mit Wasser. Diese farbigen Stoffbanner oder Goldbronze-Banner hängen an den vier Ecken eines Baldachins für Initiationszeremonien. Die Felder enthalten Durchbrucharbeiten von Bodhisattva-Figuren, engelsartigen Himmelswesen, Löwen, chinesische Arabesken oder Geißblattranken (nindootsuru monyoo), shinobu fuyu). Im Laufe der Zeit werden die einzelnen Felder immer kleiner, bis sie schließlich fast quadratisch werden. Beispiel: Das Große Banner des Tempels Hooryuuji, Nara, aus dem Jahre 747. Als der indische König Ashoka krank lag, wurden Banner aufgestellt und Gebete an den Buddha der Medizin, Yakushi Nyorai (Bhaishajya-guru) gesprochen. Der König wurde daraufhin wieder gesund und lebte noch 12 Jahre lang. Seit dieser Zeit wurden fünffarbige Banner für Zeremonien zur Gesundung bei schwerer Erkrankung eines Tennoo oder anderer hochstehender Persönlichkeiten verwendet. Die Gebete erfolgen an die sieben Inkarnationen eines Yakushi Nyorai (shichibutsu yakushihoo) zur Heilung von Krankheit oder für eine einfache Geburt. Bei lebensverlängernden Riten hängen an den vier Ecken des Baldachins über dem Altar jeweils zwei gelbe Banner, während bei gefügigmachenden Riten und Liebeszauber neunfarbige Banner verwendet werden.